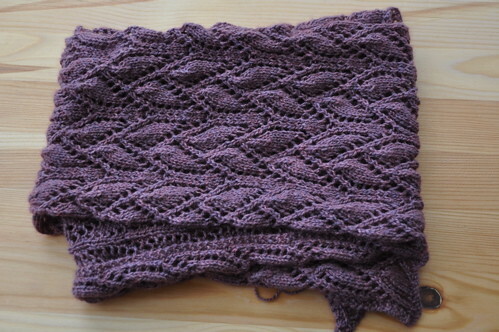 Finally finished my Campanula scarf. It felt like this took forever, and how do you make scarf progress reports interesting? A 7 sided shape is called a heptagon. The Latin word for 10 is "decem", as in December, the tenth and final month in the Roman calendar before they added July and August in honour of Ceasar. A note played for 1/16 the duration of a whole note is called a semi-quaver. The 19th President of the United States was Rutherford B. Hayes. Motion picture film is usually projected at 24 frames per second. I was hoping to get up to 27 repeats, but I was almost out of yarn at 24 and tired of the scarf. The yarn is very fragile, I won’t block it with wires, only minimal pin blocking. It is very soft, but the tangling of this skein, and reports from other people on Ravelry of their tangling nightmares mean I won’t get this again. I’ve given that yarn a severe blocking, and it was fine…so don’t be too nervous about it. Scarves are dull, but it is beautiful, and I imagine you will love it this winter!